The X-ray structure of the MS2 coat protein-operator RNA complex reveals the existence of quasi-synmetric interactions of adenosines -4 and -10 in pockets formed on different subunits of the coat protein dimer. Both pockets utilize the same five amino acid residues, namely Val29, Thr45, Ser47, Thr59, and Lys61. We call these sites the adenosine-binding pockets. We present here a heterodimer complementation analysis of the contributions of individual A-pocket amino acids to the binding of A-4 and A-10 in different halves of the dimer. Various substitutions of A-pocket residues were introduced into one half of single-chain coat protein heterodimers where they were tested for their abilities to complement Y85H or T91I substitutions (defects in the A-4 and A-10 half-sites, respectively) present in the other dimer half. These experiments provide functional tests of interactions predicted from structural analyses, demonstrating the importance of certain amino acid-nucleotide contacts observed in the crystal structure, and showing that others make little or no contribution to the stability of the complex. In summary, Val29 and Lys61 form important stabilizing interactions with both A-4 and A-10. Meanwhile, Ser47 and Thr59 interact primarily with A-10. The important interactions with Thr45 are restricted to A-4. The interaction of MS2 coat protein with its translational operator is one of the best-understood examples of RNA-protein recognition, having been studied extensively by genetic, biochemical, and structural means . The primary and secondary structures of operator RNA are shown in Figure 1. This RNA hairpin makes contacts with both subunits of a coat protein dimer. One of the most important features of the complex of coat protein with its RNA target is the insertion of two unpaired adenosines into equivalent pockets on different subunits of the coat dimer (Figure 2). The interactions of A-4 and A-10 with coat protein involve non-identical contacts with the same five amino acid residues, namely Val29, Thr45, Ser47, Thr59 and Lys61 [2, 3]. X-ray crystallographic analysis infers specific amino acid-nucleotide contacts, but does not by itself allow a clear definition of their individual contributions to RNA-binding and translational repression. In the experiments described here we introduced amino acid substitutions of A-pocket amino acids in single-chain coat protein heterodimers in order to determine the role of each residue in interaction with A-4 and A-10. The sequence and secondary structure of the MS2 translational operator. Note the positions of A-10 and A-4, the two nucleotides whose interactions with in the A-pockets of MS2 coat protein are the subjects of this paper. A Binding of RNA (yellow) on the surface of the coat protein β-sheet. The two polypeptide chains are in green and blue. A-4 and A-10 (in cyan) occupy identical binding sites on different subunits of the coat protein dimer. They are shown here surrounded by the five amino acid residues (in red) that make up these pockets. B. A more detailed look at the two A-pockets. A-4 pocket is on the left and A-10 is on the right. Amino acid substitutions in the RNA-binding site of coat protein, including substitutions of A-pocket residues, result in reduced affinity for translational operator RNA and therefore compromise its ability to carry out translational repression. However, since coat protein is a symmetric homodimer, substitutions are necessarily introduced simultaneously into both halves of the molecule, making it difficult to distinguish the separate effects of mutations on binding of different halves of the asymmetric RNA ligand. We previously described a means of making this distinction based on the phenomenon we call heterodimer complementation. We have explained its basis in detail elsewhere [4, 5], but the basic ideas are depicted in Figure 3 and briefly reiterated here. Heterodimer complementation. Because it is a symmetric dimer, every coat protein molecule contains two RNA-binding sites, each related to the other by a dyad axis. An individual RNA-binding site is in turn comprised of two half-sites, A and B (or A' and B'), where a half-site is defined by the contribution of an individual submit of the dimer to one intact binding site. 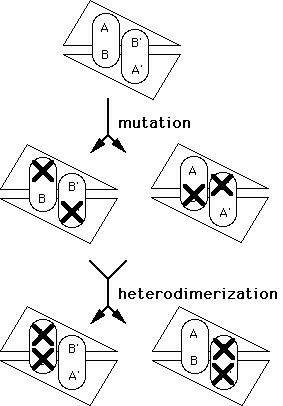 An "x" indicates the introduction of a mutation into either half-site A (and A') or B (and B'). In mutant homodimers both binding sites are inactive and a translational repressor defect results. However, when heterodimers are produced from coat proteins having lesions in different half-sites, one intact binding site is created and translational repressor function is restored. We call this heterodimer complementation. Heterodimer complementation relies on the ability to genetically fuse the two subunit of coat protein , thus producing a single-chain dimer in which the two subunits are covalently linked. This fused dimer has the same RNA-binding and capsid assembly properties typical of coat protein itself, with the important difference that the two halves of the molecule can be manipulated separately. In other words, we can produce heterodimers that contain different amino acid substitutions in their two halves. Because of its symmetry, and because it binds an asymmetric ligand, coat protein bears two equivalent RNA-binding sites, related to each another by a dyad symmetry axis. Since the RNA ligand makes contacts with both subunits, each binding site is made up of amino acids contributed by both monomers. We think of each of the two equivalent, symmetry-related RNA-binding sites as being comprised each of two half-sites, where we define a half-site as representing the contribution of a subunit to one complete binding site (see Figure 3). After RNA binding the subunits can be distinguished by the asymmetric nature of their contacts with RNA. We follow the convention of Valegard, et al. and refer to the two subunits as A and B. Thus we can think of each binding site as being made up of A and B half-sites. In homodimers any mutational defect in either half site occurs in both halves of the dimer and both binding sites are affected. However, the introduction of a mutation into one subunit of a single-chain heterodimer causes a defect in only one half-site and therefore inactivates only one of the two RNA-binding sites. Because one binding site remains intact, such mutant-wild-type heterodimers are functional repressors (except in cases where the mutation affects a residue that plays a role in both half-sites). When different binding site lesions are introduced into the two subunits, thereby creating a mutant-mutant heterodimer, several outcomes are possible: If, for example, one lesion affects half-site A and the other affects half-site B, one of the RNA-binding sites is doubly defective, but the other is left intact. Consequently, such heterodimers are active repressors. In the context of the work presented in this paper, this means that if a particular A-pocket mutation is functional for translational repression in combination with a lesion in half-site A, it must affect half site B where, from previous genetic and structural mapping, we know it interacts with A-10. If, on the other hand, it complements a half site B lesion, then it must primarily play a role in half-site A where it binds A-4. Heterodimers that contain either half site A lesions, or half-site B lesions in both subunits are inactive repressors. If a mutation complements defects in neither of the half-sites, then the identity of the amino acid is judged important for interaction with both A-4 and A-10. It should be noted that Figure 3 is an imperfect representation. While it illustrates the basic idea of heterodimer complementation, for the sake of simplicity it fails to adequately illustrate certain features of the binding sites. In particular, it does not show that the two binding sites are, in reality, overlapping. In fact, the purpose of this paper is to attempt to distinguish features within the overlap by defining the roles of A-pocket residues and assigning them to half-sites. The reader should also be alert to the possibility of confusing "A-pocket", which is shorthand for "adenosine-binding pocket", with the term "half-site A", which refers to those amino acids involved in binding RNA on subunit A of the coat protein dimer. To implement the heterodimer complementation scheme we created a series of substitutions of each of the A-pocket amino acids. For each mutant we constructed four different kinds of single-chain dimers. Mutant homodimers have the same defect in both submits. Wild-type-mutant heterodimers have a mutation in only one subunit and tell us whether the identity of the mutated A-pocket amino acid is important on only one half of the dimer. The other two types of constructs were heterodimers of A-pocket substitutions with either Y85H or T91I. We used Y85H to inactivate half-site A (where A-4 is bound) and T91I to inactivate half-site B (the site of A-10 interaction). These are well-characterized substitutions of amino acids whose roles in RNA binding are known from biochemical, genetic and structural studies. Mutations that restore translational repression when paired in heterodimers with Y85H map to half-site B, while those that complement T91I map to half-site A. Effects on translational repression were determined by measuring the β-galactosidase activity produced from lacz fused to the translational operator in the plasmid called pRZ5. Wild-type coat protein typically represses β-galactosidase synthesis to about 1–3% of the unrepressed value. A note about nomenclature: We name mutant homodimers by placing the numeral "2" in front of the amino acid substitution. For example the V29A single-chain homodimer we call 2V29A. We name heterodimers by listing both substitutions, with the mutation in the 5'-monomer given first, for example V29A-Y85H, V29A-T91I, or V29A-WT, where WT refers to the wild-type sequence. The plasmid called p2CTdl-13 contains the WT-WT single-chain homodimer sequence . We used pUCter3 as a non-repressing control . The ability of coat protein to fold correctly is sometimes sensitive to amino acid substitution. To ensure that any particular mutation does not grossly perturbed coat protein structure we subjected each of the mutant proteins to a test of its ability to assemble into virus-like particles , an activity sensitive to folding defects. This was accomplished by subjecting cell lysates to electrophoresis in agarose gels, followed by blotting to nitrocellulose membranes. Probing with anti-MS2 serum and 125I-protein A reveals the amount and the electrophoretic mobility of the coat protein produced by each plasmid construct. Since virus-like particles have a characteristic electrophoretic behavior, this provides a simple means of assessing a mutant for acquisition of native protein structure. We have used this method extensively to assess the proper folding of coat protein and representative results can be seen in previous publications from this laboratory [5, 7]. Our results showed that some mutations disrupted coat protein structure when introduced into the conventional dimer. Specifically, substitutions of Val29 and Lys61 generally resulted in failure to produce virus-like particles, while Ser47 and Thr59 tolerated all the substitutions we introduced. We previously reported that Thr45 has a remarkable sensitivity to substitution and that fusion of coat protein subunits in the single-chain dimer reverts these and other coat protein structural defects [5, 8]. This was also the case with the mutants we describe here, all of which formed normal or near normal amounts of capsids in single-chain homodimers and in their heterodimers with wild-type, Y85H and T91I (results not shown). X-ray structural analysis suggests that the hydroxyl of ThrA45 makes H-bonds with N6 and N7 of A-4. ThrB45 is said to Hl-bond with N1 and N6 of A-10 [2, 3]. In a fore-runner of the current work we determined the effects of introducing all 19 amino acid substitutions of Thr45 and created heterodimer constructs to test the separate roles of the two Thr45's on binding of A-4 and A-10. In summary, we found that RNA binding activity tolerates substitution of ThrB45, but not of ThrA45. In other words, Thr45 makes crucial contacts with A-4, but tolerates substitutions in the site where A-10 is bound. These experiments were related in an earlier report  and are not further elaborated here. Structural analysis shows that the side chain of Val29 approaches the faces of both A-4 and A-10 in their respective binding pockets. We previously isolated a mutant, V29I, which increases the size of the side chain while retaining its aliphatic character. The V29I mutant is a translational super-repressor in vivo and binds RNA 7.5-fold more tightly in vitro . This suggested that the increased size of the isoleucine side chain compared to valine might improve a hydrophobic interaction with one or both adenosines. Here we describe the introduction of other substitutions of Val29 that seek to determine the role of the size of the hydrophobic side-chain. V29A reduces the size of the side-chain, asking whether Val29 approaches the A's closely enough to provide a stacking-like interaction. V29L, like V29I, provides a greater surface area for interaction. V29F increases the bulk of the side chain even further, as do V29Y and V29W. The introduction of alanine at position 29 must severely disrupt protein-RNA contacts since translational repression is abolished nearly completely in the 2V29A homodimer (Table 1). Being smaller, the alanine side chain apparently is unable to form as good interaction with the adenosines as does valine. The fact that the V29A-Y85H and V29A-T91I heterodimers only partially recover repressor activity, and to about the same extent, indicates that Val29 makes contacts of roughly equal importance at both A-4 and A-10. In other words, the V29A substitution fails to complement fully mutations in half-sites A and B. On the other hand, several amino acids with larger side chains, each of them hydrophobic (or predominantly so), are acceptable replacements. In fact, as we have already said, V29I represses better than wild-type. 2V29L is also a competent represser, nearly as good as wild-type, as are also the V29L-WT, V29L-Y85H, and V29L-T91I heterodimers. Both 2V29F and 2V29Y showed only small defects in repression, defects which were not fully corrected in any of the heterodimer constructs. Tryptophan was the bulkiest substitution we introduced and it resulted in a fairly severe represser defect when present in both halves of the dimer (2V29W). However, nearly all the repressor activity was restored in the V29W-WT heterodimer. The observation that repression is restored more completely in V29W-T91I than in V29W-Y85H indicates that the effects of the V29W substitution are more severe in the pocket where A-10 is bound. Effects of substitutions of Val29 on translational repression. The numbers shown are the relative β-galactosidase activities produced by bacteria containing the indicated plasmid constructs. On structural grounds Ser47 has been thought to contribute to RNA-binding in both A-pockets [2, 3]. The Oγ of SerA47 appears to H-bond to N1 of A-4 while the Oγ of the SerB47 side chain H-bonds to N3 of A-10. 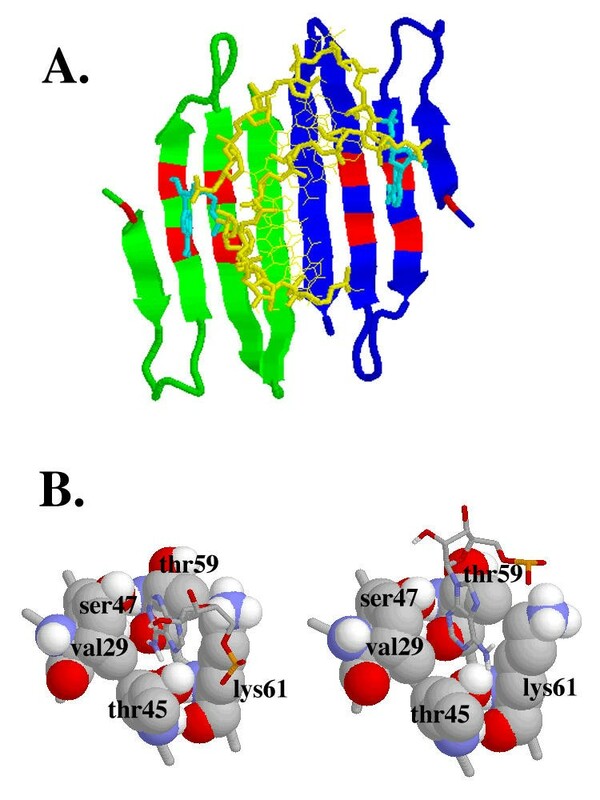 We previously showed that introduction of arginine at position 47 resulted in a repressor defect , and heterodimer complementation experiments suggested that S47R disrupts an interaction with A-10 . The results presented here confirm and extend the earlier result using more subtle substitutions. The mutant called S47C replaces Ser47 with cysteine, which is isosteric with serine but a poorer H-bonder. Substitution with alanine (in S47A) entirely eliminates the ability to form an H-bond. Both 2S47A and 2S47C are repressor-defective, and by about the same amount (Table 2). Repression is restored to wild-type levels in the S47A-Y85H and S47C-Y85H heterodimers, but not in S47A-T91I or S47C-T91I. Therefore the identity of Ser47 is only important in the A-pocket where it contacts A-10 through an H-bond with N3. The interaction with A-4, predicted from x-ray structural analysis, apparently makes little or no contribution to RNA binding energy. Effects of substitutions of Ser47 on translational repression. The numbers shown are the relative β-galactosidase activities produced by bacteria containing the indicated plasmid constructs. Together with Lys61, Thr59 forms one wall of each of the A-binding pockets. Its close proximity to both A-4 and A-10 suggests substitutions here might affect RNA binding. In fact, the main chain carbonyl of residue 59 appears to be H-bonded to the exocyclic amino group (N6) of A-4 in subunit A. We already know from the effects of amino acid substitutions previously introduced here that the identity of residue 59 is of some importance. For example, T59A and T59S are both repressor-defective in vivo [7, 10], although there seems to be some disagreement as to exactly how defective T59S is for RNA binding in vitro [7, 11]. On the other hand, glutamine seems to be tolerated here, since T59Q, is a good repressor . Inspection of the crystal structure suggests a possible reason for the importance of Thr59. The methyl groups of the Thr59's approach the faces of both A-4 and A-10, and this may help provide a hydrophobic environment for the bases. Neither alanine (T59A) nor serine (T59S) can perform this function. We constructed T59L and T59I to test the effects of some other hydrophobic side chains. The proximities of the Thr59's to the two A's also suggest the possibility of engineering stacking interactions by the substitution of threonine with each of the aromatic amino acids in the mutants we will call T59F, T59Y, and T59W. The various Thr59 substitutions we constructed are all virtually as active as wild-type in heterodimer combinations with WT and with Y85H, the half-site A lesion (Table 3). On the other hand, each of the mutations is about as defective in heterodimers with T91I as it is in each of the Thr59 mutant homodimers. This means that Thr59 plays a role in binding RNA in half-site B where A-10 is bound. This confirms the results of earlier heterodimer complementation experiments that already showed that T59S is a member of half-site B . However, these new results show that a range of substitutions of Thr59 are well tolerated in half-site A, while a range of substitutions in half-site B compromise translational repression, each to a comparable extent. Effects of substitutions of Thr59 on translational repression. The numbers shown are the relative β-galactosidase activities produced by bacteria containing the indicated plasmid constructs. The crystal structure of T59S in complex with wild-type RNA has been determined . It showed only slight differences compared to wild-type. Several possible structural explanations for poor repression by T59S were offered: 1. The loss of the Thr59 methyl group results in a reduction of hydrophobic interaction area of 25Å2 (out of 700 Å2 total). This should reduce binding affinity somewhat but seems insufficient to account for the observed in vivo defect. 2. The T59S mutants may pay a higher entropic cost in binding RNA since Ser59 could be more mobile than Thr59. 3. The most significant structural change in the T59S-RNA complex was the movement of GluB89 and the apparent loss of a water molecule bound to its side chain. Since GluB89 resides within 6.5A of A-7, G-8, and G-9 it was suggested that GluB89 could interact with these bases transiently in the binding pathway. Our results confirm that the important changes are indeed associated with subunit B. We also point out that the RNA main chain passes near ThrB59, causing us to wonder whether some substitutions here create steric clashes, thus contributing to an RNA-binding defect by introducing an unfavorable contact. The aliphatic portions of the side chains of both Lys61's may play roles in RNA binding since they cross the faces of both adenosines. In addition, the ε-amino group of Lys61 seems to interact on the B subunit through salt links with the phosphates of A-10 and G-11. The importance of these phosphate contacts has been supported by the results of phophorothioate substitutions . Structurally-based predictions of the role of Lys61 on the A subunit, on the other hand, are less clear. It appears to have some flexibility in its complex with wild-type RNA since its electron density is weak [2, 3]. It is located roughly in position to interact with the ribose or the phosphate of A-4. Moreover, in complex with a variant RNA it is seen to interact through its ε-amino group with the phosphate of nucleotide -5 . Phosphorothioate substitution implicates the A-4 phosphate in interaction with protein, but since LysA43 also forms a contact here a possible involvement of LysA61 is obscured. We previously isolated the K61R mutant, which replaces Lys61 with arginine, resulting in a repressor defect. Heterodimer constructs with the K61R mutant already showed that the identity of Lys61 is important in both halves of the dimer . In other words arginine fails to functionally substitute for lysine even when it is present on only one subunit of the dimer. In the present study we made additional mutations. To eliminate most of the side-chain, K61A introduces alanine at this position. K61M was constructed to test the role of the ε-amino group. Methionine has a hydrophobic side chain about the same length as the aliphatic portion of the lysine side chain, but lacks the terminal amino group. The close proximity of Lys61 to both A-4 and A-10 suggests the possibility that the introduction of aromatic residues may allow stacking interactions. We, therefore, also constructed K61F, K61Y, and K61W. The substitutions introduced at position 61 generally resulted in severe repressor defects (Table IV). Most of these defects are only partially corrected in heterodimers with wild-type or with Y85H and generally are not improved at all in heterodimers with T91I. It is notable that the K61M substitution, which was designed to preserve the aliphatic characteristics of the lysine side chain while eliminating its amino group, causes a severe repressor defect in mutant homodimers. Repression is only slightly improved in heterodimers of K61M with T91I, with somewhat greater improvement when combined with Y85H. 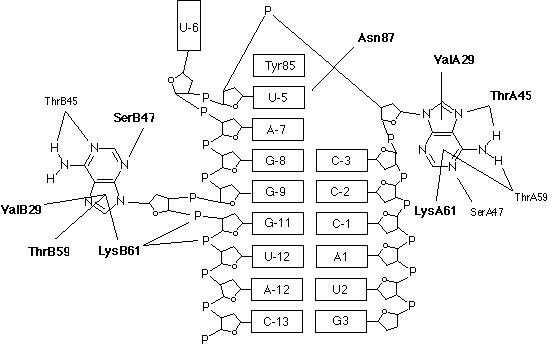 These results suggest that the identity of the Lys61's is important for interaction with both A-4 and A-10, and further, that the ε-amino groups contribute importantly to the energy of interaction on both subunits of the dimer, perhaps somewhat more importantly at A-10 (i.e. LysB61). Effects of substitutions of Lys61 on translational repression. The numbers shown are the relative β-galactosidase activities produced by bacteria containing the indicated plasmid constructs. The results we present here emphasize the importance of combined functional and structural approaches to understanding molecular interactions. Some of the contacts observed in the x-ray structure of the MS2 RNA-protein complex clearly make little or no contribution to its stability. Our results are summarized in Figure 4, where we schematically illustrate the important interactions at A-4 and A-10 in the context of the structure of the whole translational operator. To recapitulate, Val29 and Lys61 make important stabilizing interactions with both A-4 and A-10. On the other hand, the contributions of Thr45, Ser47 and Thr59 are highly asymmetric. Thr45 contributes to binding only through its interaction with A-4, while the effects of Ser47 and Thr59 are confined to their interactions with A-10. A schematic of the bound structure of the operator, summarizing the contacts between the A-pocket amino acids and A-4 and A-10 predicted from structural analysis. We have highlighted in bold the amino acids whose interactions with RNA contribute to stability of the RNA-protein complex in vivo as determined by heterodimer complementation of translational repressor activity. Mutations were introduced by site-directed mutagenesis of pCT119 [6, 7] using the method of Kunkel et al. . Mutants were identified by nucleotide sequence analysis and in all cases the nucleotide sequence of the entire coat coding region of each mutant was determined. Fused dimers were constructed as derivatives of p2CTdl-13, a plasmid whose construction and properties have been described elsewhere . The ability of the coat mutants to assemble into virus-like particles was assessed by agarose gel electrophoresis and western blot . Blotted coat proteins were visualized using anti-MS2 serum and 125I-protein A. The relative in vivo RNA binding activities of the various mutants are reflected in their abilities to repress translation of a replicase-β-galactosidase fusion expressed from pRZ5 in E. coli strain CSH41F- . Assays of β-galactosidase activity were performed by the method of Miller . The values we report are the averages of three assays. Although there is some variability in these measurements the variations are usually no larger than 5–10% and never exceed 30%.